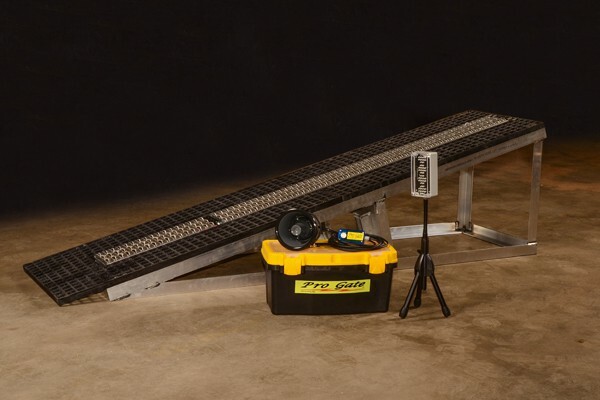 For years our single-rider “Safety Gate” has been used to train world-class athletes. If you’ve seen one, you know, it is a serious piece of hardware, built from the most durable materials available. That “industrial strength” is required for the UCI Worlds, but not for a driveway rig. So, we set out to develop a “prosumer-grade” system that met our high standards, but was more affordable, and easier to use. The result of that development is Pro Gate Junior. Now, you’re never more than a five-minute setup away from rippin’ gates at home. Pro Gate Junior includes an integrated ramp/gate, innovative “one-touch” controls, lights, speaker and supporting hoses and hardware to make your home rig as serious as the one on the starting hill, but super-easy to set up every day. Two Pro Gate Junior rigs can be joined together for two-rider practice sessions. Check out the PDF brochure for photos of that in action. Call, or complete the form below for more info on the big daddy of BMX practice gates, Pro Gate Junior. Two models are now available: Pneumatic (which utilizes an air ram, just like the gate at the track), and magnetic (which does not require an air compressor, and allows easier portability).